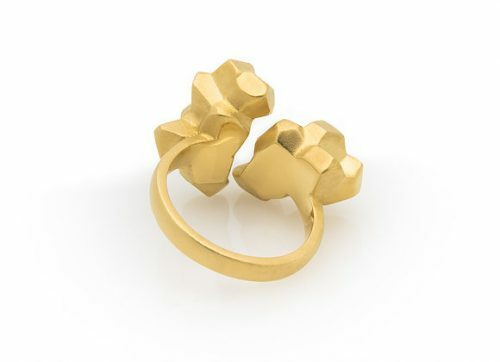 Instigated by the continually-transforming volcanic landscape of Hawaii’s Big Island, the Ore Series by Sheinfeld Rodriguez is a collection of unconventional jewelry designs that includes our Fracture interlocking earrings and our award-winning Ore 69 stud earrings. These unusual earrings are a synergistic expression of the relationship between nature’s elemental formations and human’s avant-garde technologies. 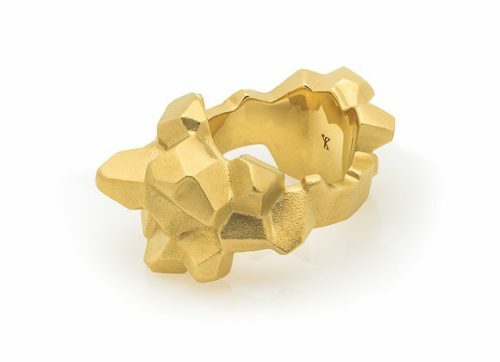 Based on a form-finding process that mimics the living world’s evolutionary system of design, this contemporary jewelry series explores the innumerable possible permutations of nature’s patterns and strategies. We merge our background in architecture and design with advanced 3D-sculpting technology and time-honored fabrication methods to forge modern adornments with an edge. 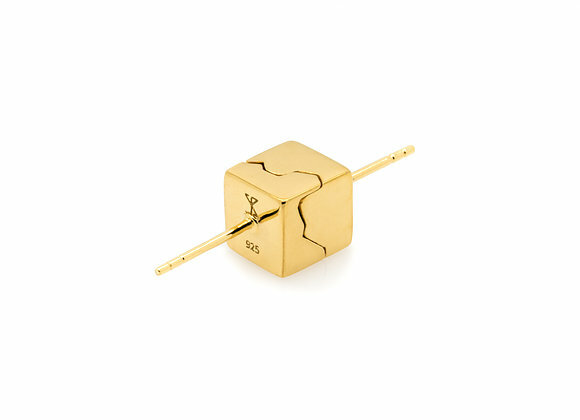 For every Sheinfeld Rodriguez design, our aim is to create a piece of modern jewelry that has an identity of singularity. We develop each concept as if it is a micro-architectural project, giving meticulous attention at every stage of the design and fabrication process. 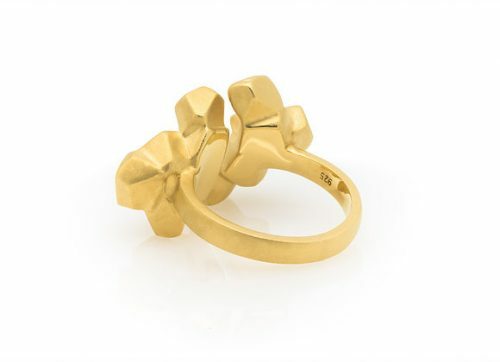 Though jewelry makers have increasingly utilized 3D printing technologies such as Stereolithography and Selective Laser Sintering to conveniently manufacture machined pieces, at Sheinfeld Rodriguez we intermix the same technical precision with time-honored traditional artistry to create unconventional handmade jewelry. We find that it is the fusion of vanguard technology and human mastery that results in interesting outcomes such as the unusual earrings in our interlocking Ore Fracture series. The technology of 3D printing, also known as additive manufacturing technology, enables us to create pieces that would be almost impossible to manufacture by hand. It allows us to generate stronger joints formed from one continuous piece of metal, rather than separate pieces soldered together, and aids us to construct objects with minute details and calculated precision. Though these attributes are highly valuable to our design process, we choose not to depend exclusively on technology for the final outcome of our pieces, as it is the human hand that brings the uniqueness to our jewelry. During the developmental phase of our first jewelry series it became very clear to us that we wanted to maintain an essence of humanness in our pieces. The benefits of technology were obvious and compelling to us. However, we found that final pieces 3D printed directly from a machine often appeared cold and stark, as if they were missing something. To create pieces that coincided with our vision, we began to experiment with intermingling the two worlds, the futuristic with the venerable, because we wanted to utilize today’s technological advancements, yet maintain the subjectivity of the human hand. Through our research we discovered that Bali, Indonesia is word renowned for its highly-skilled, inter-generational silversmith and goldsmith artistry. Historically, the Royal Courts of Bali were avid patrons of the jewelry arts, and many of the Balinese precious metal craft techniques date back nearly 700 years. A Balinese friend of ours living on Big Island, Hawaii suggested we travel to his hometown, a historical center for master jewelry artistry; a trip to Indonesia was booked. Introduced to his family in Celuk on the east side of the Island of Bali, we were expertly guided to the artisan foundry that we work with today. 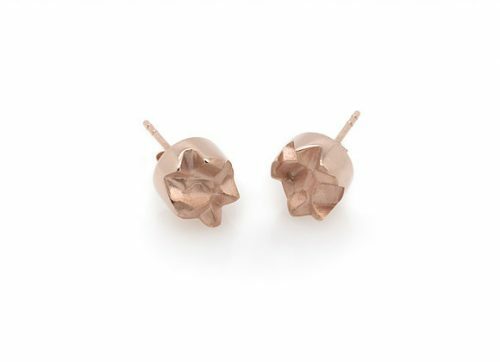 Provoked by the naturally occurring solid element from which a metal or valuable mineral is extracted, the stud earrings from our Ore Series are an interface between raw nature and technology. A contemporary expression of the elemental beauty of the natural world, the Ore 69 and the Fracture earrings demonstrate the complexity behind simple forms. This interlocking earrings series is a group of sculptural, wearable objects evolved from the idea of the continual movement of geological formations. These asymmetrical earrings express traces of tectonic and dynamic impermanence, as if broken metallic crystals are extracted directly from the natural source. 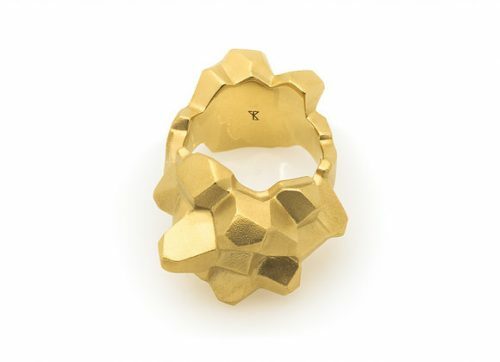 A raw mineral is transformed into a contemporary wearable design. The design of the Ore 69 earring examines the idea of a hand-mined element that has been inadvertently discovered in nature. Using realistic physics-simulation software, a basic geometric shape is broken open, exposing the core. Implementing Stereolithography, the computer-generated model is then 3D-printed into castable wax resin. The final piece is crafted from noble metals including 925 Sterling silver and 22K gold, and finished with the use of time-honored, artisanal techniques. Providing a bold statement within the delicate context of a classic piece of jewelry, these unusual earrings have a raw, artistic edge, while retaining a measure of subtlety. 1.	obtain (coal or other minerals) from a mine. 2. dig in the earth for coal or other minerals. 3. delve into an abundant source to extract something of value, especially information or skill. 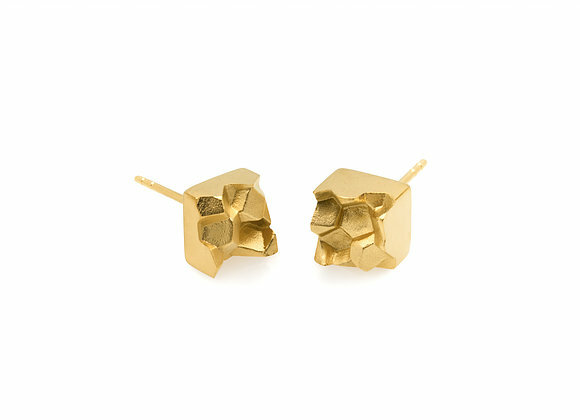 The Fracture earring design is an examination of the fragmentation of a cube. The iconic architectural shape, a three-dimensional solid object bounded by six square faces, facets or sides, with three facets meeting at each vertex, is representative of symmetry, simplicity, and rationality. As if volcanic igneous rock, the cube is broken open, revealing within it an irregular, cragged, crystal-like interior. 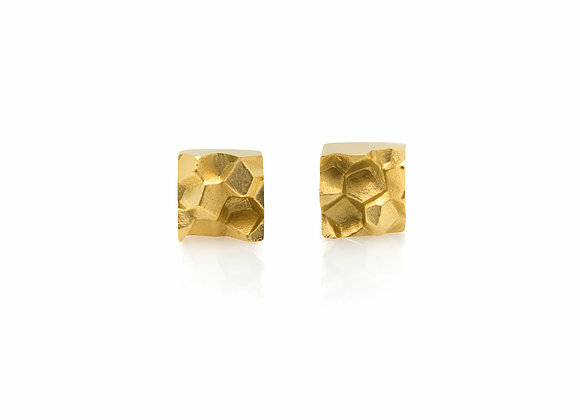 A pair of atypical earrings is formed by the two asymmetrical halves of the perfectly uniform cube, flawlessly interlocking with each other when not being worn. This interlocking expression is only possible due to the advanced software programs and pioneering 3D printing technologies utilized by our design studio. 1.	the cracking or breaking of a hard object or material. 2.	a crack or break in a hard object or material, typically a bone or a body of rock. 3.	the physical appearance of a freshly broken rock or mineral, especially with regards the shape of the surface formed.